Interested in a 2018 Toyota? Are you thinking about purchasing a new vehicle? Now is a great time to find a Toyota that is perfect for you right here in Hattiesburg, MS. Toyota of Hattiesburg is offering $2,000 off any new 2018 Toyota model! Toyota of Hattiesburg needs to make room for all of the 2019 Toyota models that are coming to their dealership. From now until the end of the year (December 31, 2018) shoppers can get an extra $2,000 off all new 2018 Toyota models. There are plenty of 2018 Toyota models that have long lists of features for drivers and passengers to enjoy. Interested shoppers are encouraged to stop by the Toyota of Hattiesburg dealership today to check out the 2018 Toyota inventory while this limited sale is still going on! 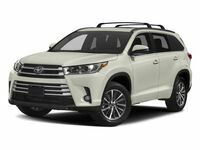 Which 2018 Toyota Models are Included in the Sale?